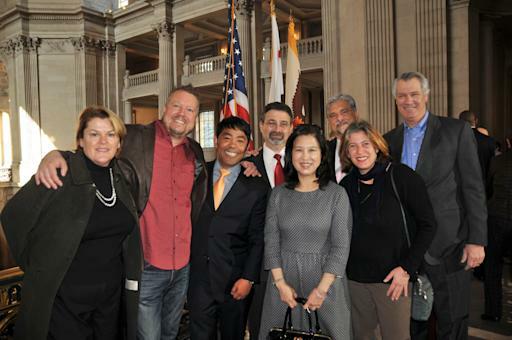 SAN FRANCISCO, CA--(Marketwired - February 12, 2015) - Darryl Honda, one of Zephyr Real Estate's Top Producers, has been elevated to the seat of Vice President of San Francisco's Board of Appeals. Honda, who was appointed to the position of Commissioner of the Board by Mayor Ed Lee in 2012, has been actively involved in the Board's work for the past two years. The Board of Appeals provides the public with a final administrative review process for appeals relating to a wide range of City determinations. Originally created under the Charter of 1932, the Board provides an efficient, fair and expeditious public hearing and decision-making process before an impartial panel as a last step in the City's permit issuance process. The Board hears and decides appeals involving the granting, denial, suspension, or revocation of permits, licenses, and other use entitlements by various City commissions and departments. Honda, one of five commissioners on the Board, is the first Realtor to be appointed to this prestigious position. He is a native Californian who has lived in San Francisco for over 35 years, attending school and working in many of San Francisco neighborhoods. He is a Realtor with over 16 years of experience, currently working with Zephyr Real Estate. Previously, he owned and operated a small business for over 15 years in San Francisco's Sunset District. He is proud of his family's multicultural heritage, which includes his maternal grandfather who emigrated from the Philippines and worked as a migrant field worker in California, and his paternal grandfather whose family emigrated from Hiroshima, Japan, to farm on the Big Island of Hawaii. Honda's many civic activities include being a founding member of the Westside Chinese Democratic Club and serving for nine years as an appointed board member of the California State Assistance Fund for Enterprise, Business and Industrial Development Corporation (SAFE-BIDCO). He attended the Academy of Art College and San Francisco Community College. He currently lives in Golden Gate Heights with his wife and two children. "I am honored to be a part of San Francisco's growth and development and will strive to keep the City's best interests at the forefront of the decision-making process," Honda said regarding this achievement. "Darryl is a excellent example of contributing and giving back to his community, and Zephyr is fortunate to count him a part of the team," commented Randall Kostick, President of Zephyr. Founded in 1978, Zephyr Real Estate is San Francisco's largest independent real estate firm with nearly $2 billion in gross sales in 2014 and a current roster of more than 250 full-time agents. Zephyr's highly-visited website has earned two web design awards, including the prestigious Interactive Media Award. Zephyr Real Estate is a member of the international relocation network, Leading Real Estate Companies of the World; the luxury real estate network, Who's Who in Luxury Real Estate; and the local luxury marketing association, the Luxury Marketing Council of San Francisco. Zephyr has six strategically located offices in San Francisco, a business center in Marin County, two brokerage affiliates in Sonoma County, and serves a large customer base throughout the San Francisco Bay Area. For more information, visit http://www.zephyrsf.com.